The Salt Room® realizes that every person who enters our spa establishment has their own unique and individual skin care concerns. Which is why we are pleased to provide customized services and products that are personalized and tailored exclusively to the needs of each individual client. Beautiful skin is a reflection of your health. Specializing in extraordinary skin care is our business. Our exceptional selection of retail skin care products to compliment and maintain skins health are available. Please call (863) 289-9476 to schedule. For those days when time is limited, but a quick pampering of the skin is desired. The mini facial includes: double cleanse, polishing, a customized mask, hydration for the skin. Great treatment to do before you travel. Our traditional facial helps to achieve healthy vibrant looking skin by purifying the skin through a customized facial. Targeting all specific skin types, this facial assists you in achieving healthy, vibrant skin and balancing oil secretions. Ideally this is a monthly regiment to maintain healthy skin. This specialized facial is recommended for those with acne prone skin. Designed to target current blemishes while helping to prevent further breakouts. Our customized facial stimulates and redefines your skin with the finest of all natural ingredients and ultra concentrated formulas. Includes a skin analysis, cleansing, exfoliation, steam and extractions (varies with skin type) followed by high-frequency to reduce inflammation and a soothing customized mask, DōTERRA essential oil's are used during the massage of your hands and shoulders, décolleté and scalp massage complete this wonderful experience. Ideally this is a monthly regimen to maintain healthy skin. This indulging high intensity treatment targets the most neglected part of your body, the back. We use products that penetrate deeply to treat the underlying causes of acne or uneven skin texture. regulates excess sebum production. Soothes inflammation and helps eliminate bacteria to promote skins clarity. Treatment can be customized for special occasions. Much like our Signature European facial. Each one is customized to specifics skin types with attention to the hair follicles on the man’s face. A gentle yet effective cleansing of young skin. Teaches teens and pre-teens the proper way to care for their skin. This powerful treatment is an advanced form of rejuvenation. It is a safe process that lifts away the outer layer of the skin, exposing the healthy epidermal tissue growth. This treatment is good for anti-aging and reducing fine lines, sun damage, and acne scars. The ultimate experience: this service combines our Signature Facial with our powerful Microdermabrasion treatment. Enjoy the soothing feeling of a customized facial that will help you achieve healthy, vibrant skin – then experience powerful rejuvenation as Microdermabrasion safely treats your face, alleviating the symptoms of anti-aging, reducing fine lines, sun damage, and acne scars. We carry a wide range of Onmacabim skin care products. They are the leading manufacturer of advanced natural products for skin health and cosmetics which include herbs from the Judean Desert with a modern technological approach as Biotechnology and Nano technology. We also offer Doterra products and Celtic Sea Salt products. 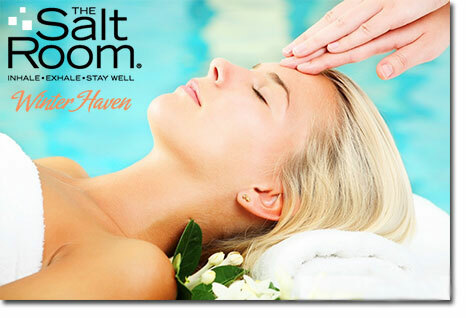 Salt Room Winter Haven provides many salt therapy services. Choose from Salt Therapy Sessions, Waxing, Make-Up, and Skin Care. Come in today and start relaxing and breathing easier - Inhale, Exhale, Stay Well.